There are several new outstanding projects highlighted on the Gelardin + Maker Hub Showcase from the past semester! All of the projects were created using the spaces, equipment, tools, and staff assistance available at the Gelardin New Media Center and Maker Hub. 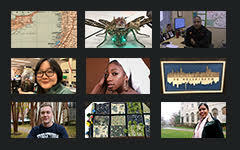 The Fall 2018 semester projects include data visualizations, Maker Hub projects, photography, videos, and more. Vote for your favorite project and like the Gelardin New Media Center on Facebook to view, share, and comment on the projects being highlighted in the next few weeks. Winners of the "Viewer's Choice" award will win a $50 Amazon gift card!